RORATE CÆLI: Cupich: In AL Francis exercises the "divinely granted Petrine power of loosening and binding"
Cupich: In AL Francis exercises the "divinely granted Petrine power of loosening and binding"
Cardinal Cupich has written the forward to a new English translation of Cardinal Coccopalmerio's booklet "A Commentary on Chapter Eight of Amoris Laetitia", previously published here on Rorate in full in April. In his endorsement of Coccopalmerio's book-long defense of adultery for the divorced and civilly remarried, Cupich cites an article by Rocco Buttiglione calling Amoris Laetitia a "development of doctrine and what it means for Popes to exercise their divinely granted Petrine power of loosening and binding in different ways and in different historical circumstances." Controversies about Church teachings have oftentimes provided new opportunities to retrieve certain truths that have become dormant, thereby resulting in sharper articulations of the faith. That is surely the case in this present moment, as some have raised questions about the apostolic exhortation, Amoris Laetitia, issued by Pope Francis, following the two synods on marriage and family life. The disputes cover a full range of issues, from how this document views the role of personal conscience to whether or not it represents an authentic development of Church doctrine. Some have even gone so far as to challenge the magisterial authority of this document signed by the pope. All of this has provoked a robust discussion by scholars familiar with Church history and our wider theological tradition and pastoral practice. For instance, Rocco Buttiglione offered us in his July 2016 L'Osservatore Romano article a lesson on the development of doctrine and what it means for Popes to exercise their divinely granted Petrine power of loosening and binding in different ways and in different historical circumstances. Likewise, James Keenan, SJ, crafted a superb remedial tutorial on the traditional understanding of conscience in America, December 2016. Finally, in the March 2017 English edition of Civiltà Cattolica, Anthony Spadaro SJ, interviewed Cardinal Christoph Schönborn about fundamental issues of this magisterial document, offering us an authoritative interpretation. Now comes Cardinal Francesco Coccopalmerio with his readers' guide to the eighth chapter of this post-synodal exhortation. He notes from the outset that this chapter is dense with themes not often in order. He writes not in any official way, nor in response to any group or person. His aim is simply to offer a careful analysis of chapter 8 to help readers "grasp its rich doctrinal and pastoral message." He is forthright in establishing that this magisterial document fully complies with traditional Church teaching on marriage, but is also in conformity with accepted standards of a pastoral approach that is positive and constructive. His exegesis of the document's treatment of the subjective conditions of conscience and the role of pastoral discernment highlights the real circumstances people face, and the mitigating factors which must be taken into consideration. His treatment of the distinct aspects of the ontology or the reality of a person's being is perhaps his greatest contribution to the ongoing discussion of Amoris Laetitia. There are elements of a person's being that are shared in common with all of humanity and understood in a general and abstract way. At the same time, there are unique elements of each individual "that in some way limit the person, especially in the ability to understand, to will and therefore to act.” For this reason, when it comes to dealing with certain so-called irregular situations, what is required is a pastoral approach that takes into consideration both the general and the individual aspects of a person's life, that is, the full ontology of the person. This, he observes, "has always been and is, especially today, crucial for the life of the Church, especially for its pastoral activity." We oftentimes hear a narrative that those working in the Roman Curia are pastorally insensitive and out of touch with the ordinary lives of people. 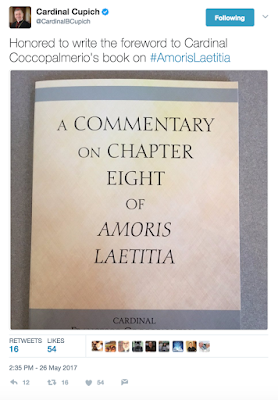 Cardinal Coccopalmerio, an accomplished canon lawyer, who serves as the President of the Pontifical Council for Legislative Texts, belies that portrayal in this exquisite exegesis of chapter 8 of Amoris Laetitia. He wisely counsels us that instead of being fearful when controversies about the faith arise, the teaching Church should rather embrace them as opportunities to be the good scribe of the Kingdom who, Jesus tells us, is "like the head of a household who brings from his storeroom both the new and the old."